Royal London tour visiting Parliament Square, Kensington Palace, Princess Diana Memorial. York: View York Minster and stroll along the Shambles. See the city walls. Today we board our flight to London to begin our fabulous Britain, Scotland and Ireland Holiday. Sit back and relax onboard your flight. Meals, drinks and refreshments are provided during the flight. Welcome to London! On arrival in London we will be transferred from the airport to the hotel. There will be some leisure time allowed before you meet your Travel Director and join them for a Welcome Dinner at a local restaurant. This morning we begin our tour and travel to Stratford-upon-Avon, where you have time to see the sights and shop for souvenirs. During your orientation of York your Travel Director will take you on a walk through the web of quaint, narrow streets and show you York Minster, one of the most beautiful Gothic cathedrals in the world. Continue to your hotel in Bradford where you dine tonight. Drive through the Yorkshire Dales to the scenic glory of the Lake District. Travelling along the shores of England’s largest lake, Windermere, and through countryside that inspired the Romantic poets, you reach Grasmere. View the grave of William Wordsworth, buried at St. Oswald’s Church. We cross the Scottish border and visit Gretna Green, where eloping couples would say their vows over the anvil. Later arrive in Edinburgh for a two night stay. This morning’s sightseeing tour with your Local Specialist includes views of the Georgian New Town, Palace of Holyroodhouse, the Royal Mile and Edinburgh Castle. Spend free time exploring on your own or join your Travel Director on an Optional Experience to the Royal Yacht Britannia in nearby Leith. This evening. 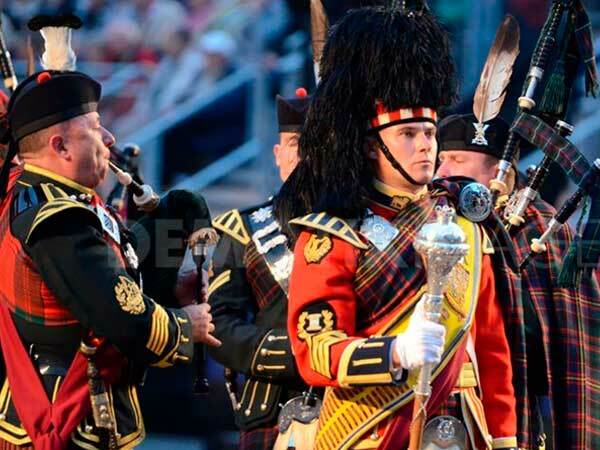 enjoy the Royal Edinburgh Military Tattoo. Follow the rugged Ayrshire coast past the island called Ailsa Craig, the stepping stone from Scotland to Ireland, then board a ferry for the short crossing to Northern Ireland. See City Hall, Queen’s University and the dock where the Titanic was built during your city orientation. Finally cross the River Boyne at Drogheda to enter the Irish capital, Dublin. See Trinity College, St. Patrick’s Cathedral, Dublin Castle, Christchurch Cathedral and the stately Georgian squares with your Local Specialist. Spend the rest of the day as you please. Why not explore Temple Bar or Grafton Street, famous for its street performers? This evening consider joining an Optional Experience to an Irish cabaret. Traverse County Kildare’s splendid countryside. In Kilkenny see the imposing medieval castle and enjoy free time for lunch. This afternoon visit the House of Waterford Crystal showroom and see the exquisite pieces. Dine tonight at your hotel. Cross St. George’s Channel to Wales, and continue your journey to Cardiff Bay to view the Millennium Centre and the National Assembly. View the historic Cardiff Castle and see the Millennium Stadium before arriving at your hotel. Today passengers on the tour will enjoy a tour of Buckingham Palace including state rooms and the beautiful Palace gardens. Also included for you is a magnificent and traditional high tea that includes decadent treats of cakes, pastries and finger sandwiches. This morning after breakfast, some free time has been set aside for any last minute shopping before we transfer to Heathrow Airport for our flight to Australia. Our flight departs late afternoon. Onboard refreshments during the flight are provided. After a wonderful summer holiday, our flight arrives back in Australia early evening. The following itinerary will take place on Day 11 onwards instead of the Buckingham Palace Tour & High Tea. We transfer to Southampton to board our 14 night Baltic Cruise on the Queen Elizabeth. Christened by the Queen in 2010, Queen Elizabeth is the youngest ship in the Conard Fleet. For relaxation between ports, the Queen Elizabeth offers open deck spaces, the garden lounge as well as the unique games deck where you can try your hand at croquet, bowls and paddle tennis in the middle of the ocean. A choice of wonderful restaurants and entertainment is always available on board, all meals included. This morning we arrive into Skagen at 10am. Skagen is a port town at the north end of Denmark’s Jutland peninsula. Near the marina, the Skagens Museum exhibits works by the Skagen Painters, who were inspired by the area’s light and landscape. The Local History Archive, in the former courthouse, illustrates the town’s history and maritime heritage. On Skagen’s northeastern outskirts, Grenen Beach is at the convergence of the Skagerrak and Kattegat seas. We sail out of the harbour at 6pm. Over the next two days we enjoy life onboard the Queen Elizabeth as we sail the protected and gentle waters of the Baltic Sea. Onboard amenities offer you time to relax as well as enjoy fine dining, activities, lectures and entertaining shows. St. Petersburg is a Russian port city on the Baltic Sea. It was the imperial capital for 2 centuries, having been founded in 1703 by Peter the Great, subject of the city’s iconic “Bronze Horseman” statue. It remains Russia’s cultural center, with venues such as the Mariinsky Theatre hosting opera and ballet, and the State Russian Museum showcasing Russian art, from Orthodox icon paintings to Kandinsky works. Our cruise remains here for two nights. There are a number of interesting and fascinating sightseeing tours of this remarkable city available. We depart St Petersburg at 6pm. This morning we sail into Helsinki, Finland at 6am. The city is Finland’s southern capital, sits on a peninsula in the Gulf of Finland. Its central avenue, Mannerheimintie, is flanked by institutions including the National Museum, tracing Finnish history from the Stone Age to the present. Also, on Mannerheimintie are the imposing Parliament House and Kiasma, a contemporary art museum. Ornate red-brick Uspenski Cathedral overlooks a harbour. We arrive in Stockholm today at 8am. Stockholm, the capital of Sweden, encompasses 14 islands and more than 50 bridges on an extensive Baltic Sea archipelago. The cobblestone streets and ochre-colored buildings of Gamla Stan (the old town) are home to the 13th-century Storkyrkan Cathedral, the Kungliga Slottet Royal Palace and the Nobel Museum, which focuses on the Nobel Prize. Ferries and sightseeing boats shuttle passengers between the islands. We depart at 4:45 today to begin our journey to Berlin, Germany. Enjoy a day at sea as we sail towards Germany. We sail into Warnemunde at 9am. The port of Warnemunde is approximately 3 hours from Berlin. Passengers may choose to take a quick excursion into Berlin or sightsee around this port city. Warnemünde is a German port town on the Baltic Sea, near Rostock. It’s known for its long beachfront and marina, a cruise-ship stop. Nearby, the Alter Strom canal is lined with shops and fishing boats. The Edvard Munch Haus, former home of the renowned expressionist painter, runs exhibitions and events. The late-19th-century lighthouse and neighboring Teepott building display distinctive East German architecture. We depart at 6pm for our journey back to Southampton, England. Enjoy 2 more days at sea as we sail towards London and take advantage of the many activities available onboard the Queen Elizabeth. You will be transferred to London Heathrow Airport this morning to board your flight back to Australia. After a wonderful summer holiday, our flight arrives back in Australia early this evening. Today after breakfast, you will embark on your wonderful European journey. From Dover see the White Cliffs as you cross the Channel to Calais. Continue through the Somme battlefields in northern France to the glittering capital city of Paris. Tonight, join your Travel Director for a Welcome Dinner. Admire the sights of Paris this morning including the Champs Élysées, Arc de Triomphe and the Eiffel Tower. Spend free time seeing more of this fascinating city. Tonight why not experience a famous Parisian cabaret show? Travel to the Loire Valley and view the Château de Amboise where Joan of Arc passed through before her battle with the English. Arrive later in Bordeaux. Head to the charming resort of Biarritz on the wild Atlantic coast before arriving in the pilgrim town of Lourdes. Cross the border into Spain and pass by the city of Burgos en route towards the cosmopolitan capital city of Madrid. See the Royal Palace and Plaza de España during your sightseeing with a Local Specialist. Later consider an excursion to Toledo. Travel through the hills of Aragon and Catalonia to the bustling city of Barcelona. This morning your Local Specialist shows you the sights including the Ramblas and the Sagrada Familia. Enjoy an afternoon exploring the city or perhaps consider joining an Optional Experience. Cross over the foothills of the Pyrenees and continue through Provence before arriving on the French Riviera. Enjoy free time to explore the French Riviera. Relax on the beach, perhaps enjoy lunch at a pavement café or join take an Optional Experience to the glamorous hilltop town of St. Paul de Vence. Visit the Principality of Monaco where you view the Royal residence. See the Leaning Tower of Pisa before arriving at your hotel near Florence. Explore wonderful Florence with time to wander through its cobbled streets before arriving in the eternal city of Rome. Visit St. Peter’s Basilica with your Local Specialist and see Michelangelo’s Pietá. View the Colosseum and see the ancient sites in Rome. In your free time consider a tour of the Sistine Chapel. Traverse the Apennine Mountains and cross the Veneto plain before arriving in the Venice region. Marvel at the sights as you cruise to St. Mark’s Square by private launch. Enjoy a demonstration of glassblowing on Giudecca island with time later to shop and explore. Travel through spectacular scenery and cross into Austria and make your way to the imperial city of Vienna. Your Local Specialist shows you the sights of Vienna including the Opera House, Hofburg, Parliament and Imperial Boulevards. Spend free time exploring or perhaps take an excursion to the vast Schönbrunn Palace. Arrive in Salzburg where you see Mozart’s birthplace as well as locations from the Sound of Music. In Innsbruck view the Golden Roof and Hofburg. Visit Vaduz, the capital of Liechtenstein. Cross into Switzerland and traverse mountain passes to picturesque Sarnen. Your orientation tour includes the poignant Lion Monument and the 14th century wooden Chapel Bridge, with free time afterwards to shop for all things Swiss. Visit Heidelberg and see the impressive Renaissance castle overlooking the town. Later arrive at your hotel and dine tonight at a local restaurant. Enjoy a leisurely cruise along the Rhine where you see steep vineyards and medieval castles. Arrive later in Amsterdam. See the historic sights of Amsterdam, and visit a diamond polishing centre. In Volendam learn about the arts of cheese and clog making. Pass through Belgium to Calais and board your ferry to Dover. Later arrive in London. Tonight, join your your Travel Director for a Farewell Dinner at a local restaurant. Today our flight arrives back in Australia early evening, after a wonderful summer holiday. Flights are included from all departure cities shown as required. These are based on Emirates ‘L’ Class Economy airfares, and are subject to availability at the time of your booking confirmation.